Chocolate is made from cocoa beans that grow on the tropical Theobroma Cacao tree. Literally translated, this genus name means “food of the gods," an appropriate accolade for this indulgent ingredient that's perhaps adored more than any other. Once harvested, cocoa beans are fermented, roasted and cracked to separate the nibs (which contain cocoa butter) from the shells. The nibs are then ground, leaving a thick, dark paste called chocolate liquor. Next, the liquor is refined according to they type of chocolate being produced. Finally, the chocolate liquor is heated and blended by huge machines with rotating blades in a process called "conching." This rids the chocolate of moisture and volatile acids and also allows other ingredients like cocoa butter or lecithin (an emulsifier) to be added for smooth, creamy texture. Milk chocolate was first produced in 1867, but it was Rodolphe Lindt who came up with the idea of adding cocoa butter to smooth out its texture in 1879. He invented a shell-shaped machine called the "conche" to churn and turn the mixture into the delicately flavored milk chocolate we still enjoy today. Chocolate varieties are best described by the percentage of chocolate liquor and cocoa butter they contain. Unsweetened, or baking chocolate, contains between 50% and 58% cocoa butter. This unadulterated chocolate is pure chocolate liquor that has been cooled and molded. It is often used for cooking. Bittersweet, frequently called dark chocolate, must contain at least 35% chocolate liquor, but many brands go way beyond that in the 60% to 75% range. This chocolate has a concentrated flavor and is not very sweet. Semisweet is also a dark chocolate, but it is somewhat sweeter and less intense. Like bittersweet, it contains at least 35% chocolate liquor as well as sugar, lecithin and vanilla. Semisweet is a popular choice for baking and comes in a wide variety of chips, squares and bars. 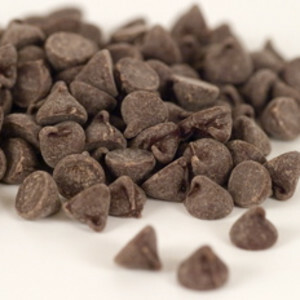 Sweet is another variety of dark chocolate that is used for cooking and eating. It contains at least 15% chocolate liquor and has flavorings and more sugar than semisweet. Milk chocolate is made when dry milk is added to sweetened chocolate. It is a combination of at least 10% chocolate liquor and 12% milk solids along with sugar, cocoa butter, vanilla and other flavorings. White chocolate is technically not a chocolate, because it contains no chocolate liquor at all. Typically a mixture of sugar, cocoa butter, milk, lecithin and vanilla, white chocolate is still a favorite for eating and cooking.